November 23rd, 2018 • Contributor: Charynn Olsheski, Pineapple Paper Co.
Hi! Charynn from Pineapple Paper Co. here again! For the last couple of weeks, I have shared how I use the Cricut Explore Air 2™ Special Edition Martha Stewart Machine Bundle, available exclusively at Michaels, to plan and create parties. 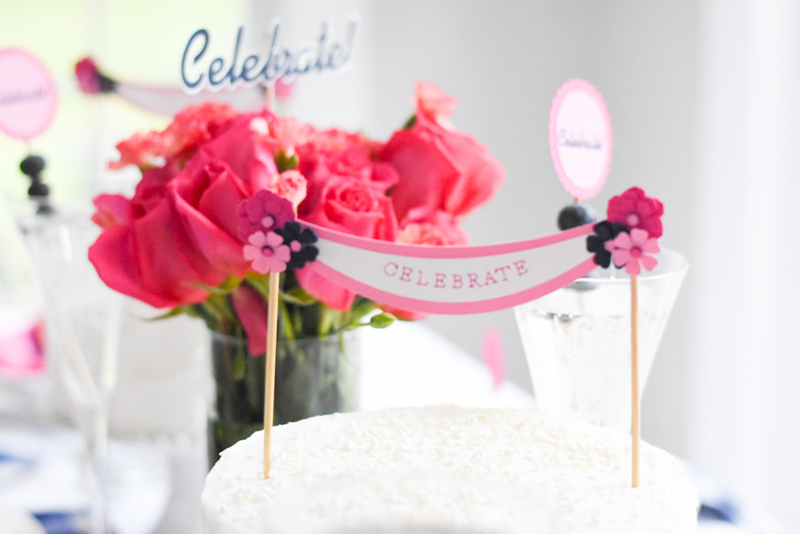 So far, I have shared: a birthday invitation made with a variety of Cricut cutting materials, different ways to wrap gifts with Cricut designs, plus an easy “Celebrate” party banner with Iron-on and table decor to dress up your party. All of these projects use the gorgeous collection of exclusive Martha Stewart designs in Cricut Design Space as well as Martha Stewart branded Cricut cutting materials. I made so many different projects with the Martha Stewart Cricut Explore Air 2 for this party! With your purchase of a Martha Stewart Cricut Explore Air 2, you get access to 25 exclusive projects and designs created for Design Space. There are also a TON of additional Martha Stewart images available that can be used to create a gorgeous party. 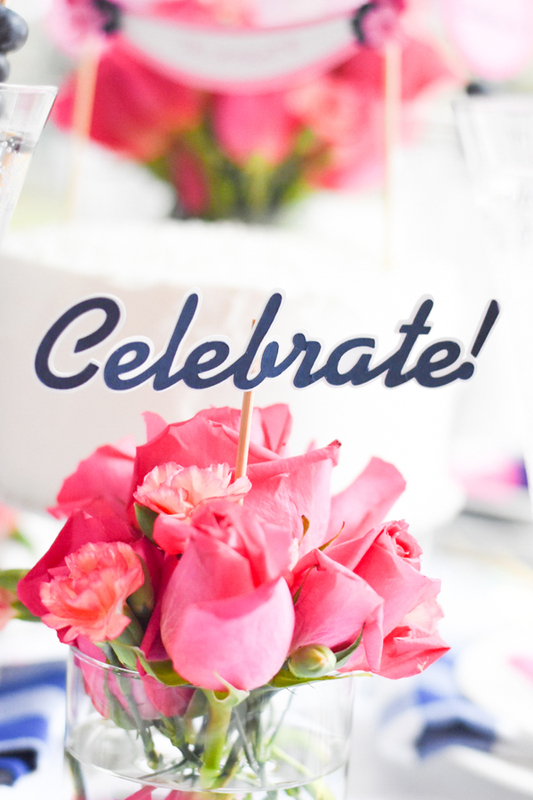 Creating a cohesive party theme is easy with a simple logo, as I did with the “Celebrate” script text from the Martha Stewart images. You can use one design in different ways throughout your party to visually tie your party together and make your crafting easier. 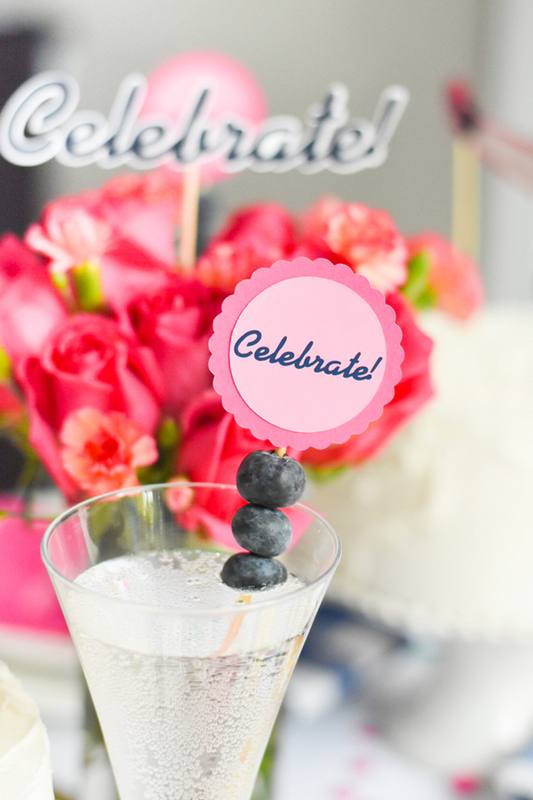 I used the “Celebrate” script to also decorate 2” round party circles that I attached to skewers of blueberries. I placed the skewers in glasses of champagne. Because a lot of drinks are clear, adding a touch of color to glasses is a small detail that looks really great on the table! 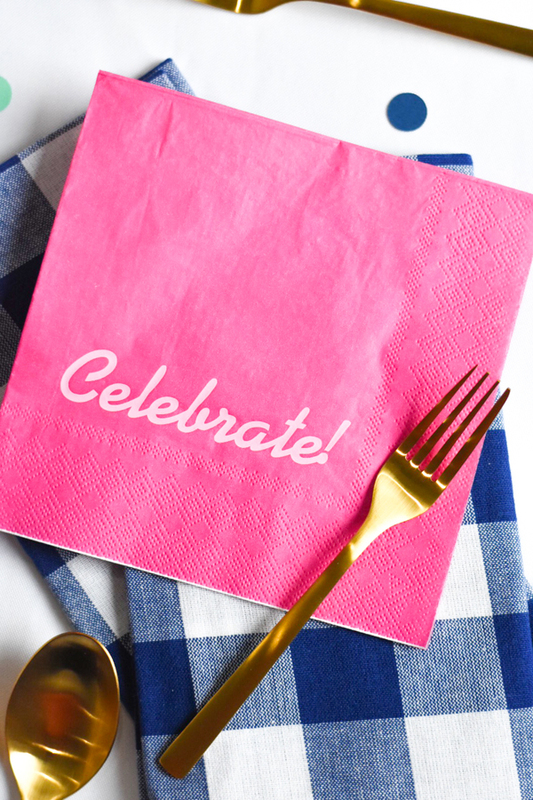 My absolute favorite DIY Party Supply to create is customized paper napkins. With Martha Stewart Iron-on and inexpensive paper napkins, I created expensive-looking custom napkins for just pennies! And with the new Martha Stewart EasyPress 2 that was just released, these personalized paper napkins are really easy to make! What party is complete without a cake? This party had three small cakes, and each one had a handmade cake topper using cardstock and Martha Stewart designs from Cricut Design Space. 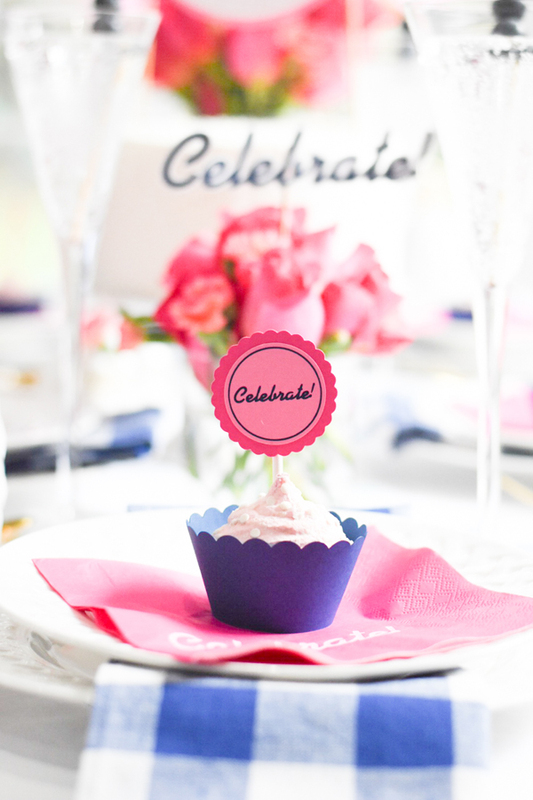 This cake topper also incorporates the use of Cricut Pens. I absolutely love using Cricut Pens to draw details on party supplies. 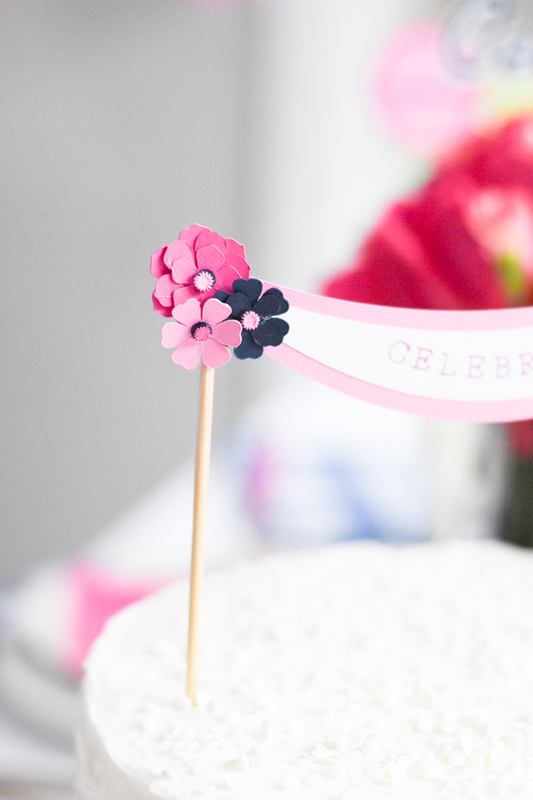 The Celebrate banner with writing is a pre-designed image, and I made little 3D flowers from a Martha Stewart design that was intended to be a table runner. I scaled the flowers down really small and used them to give the cake banner some dimension. Follow me here next week to see how I designed party favors (including the cupcake below) with the Cricut Explore Air 2™ Special Edition Martha Stewart Machine Bundle!